온도변화에 따라 저항값이 크게 변하는 감온반도체입니다. 사용온도 범위가 -50 ~ 500℃로 일상적인 온도조절을 필요로 하는 모든 범위에 응용되며, 또한 소형으로 가격이 저렴하고 고감도이므로 가전기기나 산업기기의 온도센서 및 온도 보상용으로 대량 사용되고 있습니다. 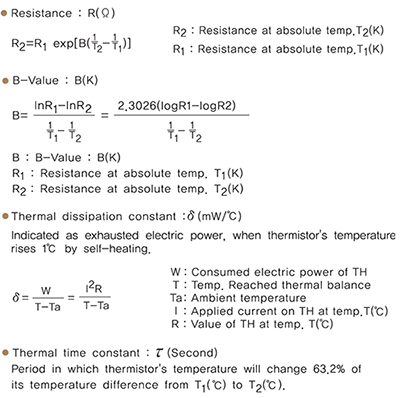 Thermistor is Thermally Sensitive Resistor which makes huge difference in resistance along the changes of temperature. Its applications are quite broad because it senses the temperaure range of -50℃ to 500℃ which can be used anything that needs to control temperature like the field of Home & Medical Appliance, Automobiles, Office Equipment and many kinds of Automatic devices. Also, it is small and cheap. 온도계수가 커서 감도가 좋고 응답성이 빨라 급속한 온도변화에 대응 할 수 있습니다. 냉접점이나 보상도선을 필요로 하지 않습니다. 고저항이므로 도선저항을 무시할 수가 있어 원격 집중제어관리가 가능합니다. As a temperature coefficient is large, it is highly sensitive. Becase of its fast response, it can follow rapid temperature change. No cold junction and compensation lead wire are required. As it has high resistance value, its lead wire resistance can be disregarded. Therefore, remote and central control is possible. 경시변화가 극히 적으며 안정되어 있어 신뢰도가 높습니다. 고객의 요구에 따라 다양한 형상으로 제작이 가능합니다. 소형으로 빠른 응답속도를 가지고 있습니다. 제조공정을 자동화하여 고품질의 제품을 대량 생산할 수 있습니다. Because of very little changes of its original characteristic with the passage of time, high stability and reliability are obtained. They can be manufactured in various type by customer's demand. Fast response time is attained due to its small size. 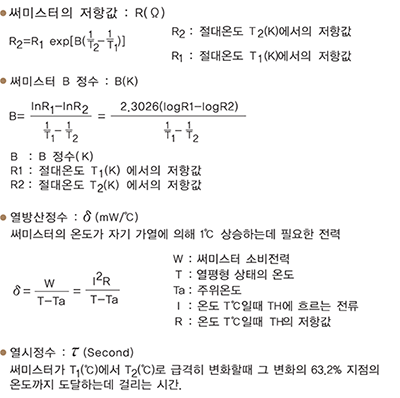 * 위 표의 THERMISTOR는 대표적인 SPEC을 나열한 것입니다. * 표를 클릭하면 크게 보실 수 있습니다.